Unlike curry or sambal paste, you do not require blending and extra frying process for the sweet and sour sauce. Even though the readily packed sweet and sour sauce is easily available in the market, but you might be even happier to know that delicious sweet and sour sauce is very easy to prepare at home. 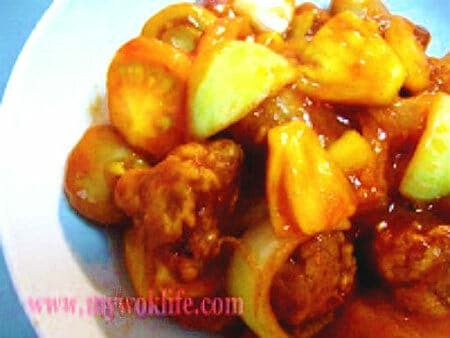 Cook an authentic sweet and sour pork dish at home, in minutes. I used 10 min to prepare this dish (excludes marinating time of 15 min). As mentioned before, making sweet & sour sauced dishes are my forte. I hope you try, and like my recipe. By the way, I used button mushroom in this recipe, and went without the green capsicum as my family does not like it. Mama loved button mushroom, and hence, I added it, just for the family. The dish turned out absolutely well! Also, I did not add carrot slices when I cooked this on Friday. Reason being, carrot needs more time (extra 5 min) to cook and soften. Since I had the carrots in my soup, it was fine to forgo it in this recipe. 1) Season pork cubes with light soy sauce and Hua Diao Wine. Add in egg, and combine well. Keep in the refrigerator, and marinate for at least 15 min. I marinated the pork since morning, before I left for work. 2) Prepare sauce in a bowl. Add all sauce ingredients in the bowl. Stir and mix well. Set aside. 3) Coat marinated pork cubes with cornstarch. Make sure all sides of pork cubes are well covered with thick flour. 4) Heat wok with oil over high heat or use deep-fryer. Deep-fry pork for 5 min, or until crisped and golden browned. Remove from wok, and drain on kitchen towel. Reserve for later. 5) Clean wok. Heat wok with 1 teaspoon of oil, stir-fry chopped garlic till fragrant. Add spring onion, tomatoes and pineapples, sauté for 2 min. 6) Return fried pork cubes to the wok, and pour in sauce mixture. Stir-fry to combine well. Fry all ingredients briefly over high heat, for 1 min. Serve. Calories of this dish count 380kcal for a decent portion. If you like more fatty meat like 3-layer pork, expect 550kcal. Tips: If you do not like watery gravy, use cornstarch slurry to thicken the sauce, like I did. See tips no.20 for directions. * If you have time, double fry the pork cubes over high heat for 1 – 3 min to obtain more crispiness. *Do not over-cook the side ingredients to retain its freshness and natural colours. No worries, I assured you the ingredients will be cooked and tender enough to taste. *Make sure the oil is hot heated at correct temperature and enough to cover the flour-coated pork. Otherwise, the outer layer of pork will turn soft and gluey, and not crisp. Keep the flame in medium – high throughout the frying process in order to yield effect of ‘moist inside and golden brown outside’. It should take no more than 5 min to do so. 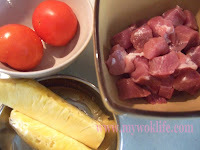 *Also, make sure the pork cubes are cut in uniform size to better control when frying. BTW, do you hv recipe for frying Kai Lan? I find it hard to fry this vegetable well without it tasting bitter!?!?! Pls advice. Hmm… pork not salty enough? I thought the taste of the sweet & sour sauce should be so over-whelmed that you should taste the sauce instead of saltiness in the pork? Nvm, if you really need to have the pork more briny taste, you may add dash of salt to the marination. And marinate overnight may make the pork even more flavoursome and salty. Oyster sauce? I am afraid adding oyster sauce might affect the overall taste of the dish. Long time did not cook Kailan… Let me cook it again one day, and I’ll try you the ‘tips’.. In the meantime, try see if blanching of Kailan before having it quick stir-fried helps? Blanch with boiling water added with sugar. Thanks for the recipe! My husband and I love it, esp the sauce! What type of tomato sauce you mentioned in the recipe? Ketchup or the tomato sauce you make pasta with? Hi, for the sauce, can i use black vinegar instead of white? would it alter the taste of the dish too much? Thanks! Hi, are you referring to the Zhe Jiang black vinegar which we use it’s dipping sauce with shredded ginger to eat pot sticker or dumpling? If yes, I would not recommend it as the taste will be different from white vinegar. The black one has a distinctive flavor that might he a little bit over-whelming for sweet and sour pork dish. Just converted into a stay home dad (work from home) and now am task with cooking dinner for my three kids and missus. This dish had her attention and she was delighted with it. I used rice flour instead of corn, as personally felt the crisp would be more. Lessen the vineger by half, but other than that, I was as what u taught. Thanks for liking it. Happy cooking! You mentioned that a decent portion is about 380 kcal! May i know how big the portion is? Like about a plate or something? A decent portion of my recipe refers to about 9-10 pcs of meat plus some pineapples and cucumbers. Hope this helps.